My daughter Alekka is away this week on her Grade 10 “Week without Walls” experience in northern Ethiopia. Alekka took a camera on the trip; if she comes back with some good pictures, I think I’ll ask her to do a guest post about her adventures in Gondar and Lalibela. The Week without Walls program begins in Grade 5, with each age level visiting a different location in Ethiopia to explore historical and natural sites and to do community service. Some parents I’ve talked to are worried about their kids on these trips: small planes, crazy drivers, bedbugs, malaria, and unclean water figure prominently in their nightmares. Am I concerned about Alekka? Nope. I guess the maternal jitters gene skipped a generation with me. However, I am very worried about Wolfy and Balto. Let me back up about eleven years. While waiting for a flight in the Portland airport, we entertained 4-year-old Alekka with a visit to the gift shop. She fell instantly in love with a plush toy husky dog. Every night for the five weeks we were in Europe, Andreas told Alekka a bedtime story about Wolfy and his human companion Gwendolyn. We were all enchanted by the tales. A near-tragedy occurred when Alekka left Wolfy behind in an Oxford B&B, but the inn owner saved the day by rushing us back in his own car to rescue our little stuffed friend. By the time we returned to Medford, Alekka and Wolfy were inseparable. Alekka listened to hundreds more of Andreas’s Wolfy tales over the next few years, and spent hours in her room writing her own illustrated stories about his adventures. When she was 7 years old we took another epic family vacation (with Wolfy, of course) across the United States and back by car. Alekka spotted Wolfy’s twin in a Boston toy store, and from then on the doggie brothers Wolfy and Balto costarred in the wild adventures. 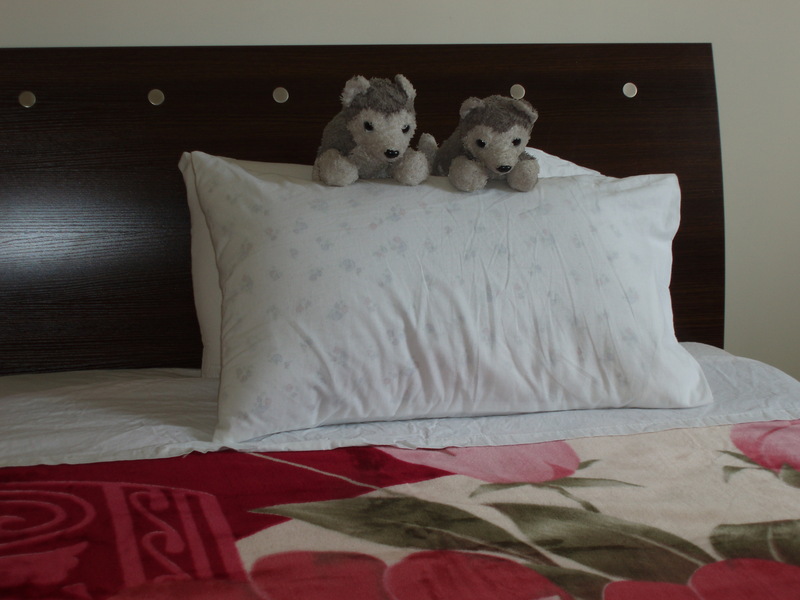 Fast forward to last winter… Wolfy and Balto are living contentedly with us in Damascus. At the holiday break we meet our oldest son Dimitri in Vienna for Christmas, after which we all take the train to Prague for New Years. Wolfy and Balto accompany Alekka, as always. We have a grand time. A few days later we’re back at the Prague train station getting ready for Dimitri to take the train back to Vienna to catch his flight home, while the rest of us are to continue on to Budapest. Standing on the platform, I see Alekka unzip her carry-on bag. She glances up at me, and I know immediately from her stricken look what has happened. Wolfy and Balto have been left behind. Somewhere. 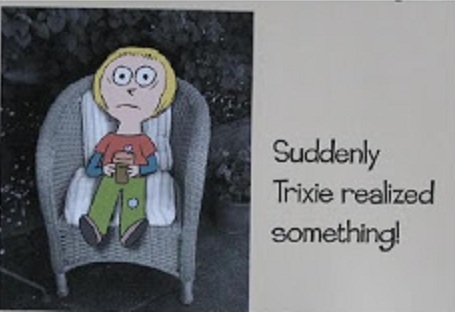 From the book Knuffle Bunny Free by Mo Willems, wherein Trixie realizes she has left her beloved toy Knuffle Bunny on the airplane she flew in to visit her grandparents in Holland. Knuffle Bunny winds up in China. This is the same look Alekka gave me. Where do any of us remember seeing them last? We’re not sure… maybe Vienna? Maybe Prague? Were they on the train with us? Andreas races on foot back to the hotel. I head to the railroad’s lost and found office (the Czech officials think I’m nuts – that’s OK, lots of people think I’m nuts). No luck. In the end, one very sad girl was riding on the overnight train to Hungary. I emailed the Vienna hotel as soon as we arrived in Budapest. A miracle! Alekka had left the doggies in her bed, and the (very very considerate) hotel owners had saved them, suspecting they would be missed by someone. Dimitri carried out the rescue mission, detouring to the hotel before his flight back to California. Wolfy and Balto had a pleasant sojourn with Uncle Dimitri in Davis, California before the big reunion in Oregon in July. Whew. Fast forward again to Addis Ababa… after Alekka left on Monday for Week without Walls, I had to get my computer (it’s the preferred medium for Doctor Who viewing) out of her room. I noticed that the doggies were not perched atop her pillow in the usual way. They were not there, not anywhere. They could only be… with Alekka on Week without Walls. Aargh!!! I am telling you right now, if they get left in Gondar, I am not going there to get them. Seriously. I’m not. Well, probably not. I’ve already looked up the flight information. This entry was posted in Around Africa, Expat experience, Family, Home life, International Community School and tagged Alekka, Week Without Walls. Bookmark the permalink. I was very impressed with how conscientious Alekka had apparently become, with such a neat bed and comfortable placement for Wolfy and Balto, who I recall not usually being treated with QUITE the same ministration. Much love and tenderness, yes. But then I realized she’s still a slob like the rest of her siblings. A relief, really, I am not prepared to be shamed into making my bed more than once a week.